Arte de Fuente has not only been a special guest co-host, recorded our intro and fan fiction music, and been a muse for young Padawan Lincoln, he has also been busy recording for several local artists! Go say hi to Thommy & Rusty at CassetteLand now! Larry is the one responsible for our awesome logo designs! Very talented guy if you are ever in the need of some graphic design work. Head over to LP Design and show him some love. What can we say about these girls... just amazing human beings. Not only were they the catalyst for us having fan fiction episodes and fan art, they have also contributed the Archive artwork! Check out the work of Voltron! 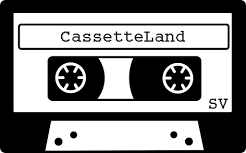 Amazed by the promo pictures and Christmas cards from Cassette Land and We Just Watched? Look no further than Hayli, our super awesome friend and business partner. Head over to HC Photography if you are looking for a professional, friendly, and talented photographer!